First Minister Nicola Sturgeon has joined hundreds of thousands of people on a march in London to demand a second Brexit referendum. She spoke to crowds gathered at the end of a rally organisers of the "Put It To The People" campaign say more than a million people attended. Bus-loads of protesters travelled through the night from across Scotland to support the People's Vote event. It came after the EU agreed to delay the UK's departure from the EU. She told the crowd that Theresa May had pitched parliament against the people. 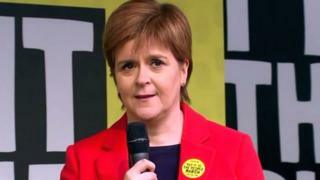 Speaking from a stage in Parliament Square, Ms Sturgeon said: "Scotland - the land where more than 60% of people voted to remain in the European Union - our voice has been ignored. "But it is not only our voice that has been ignored. The voice of the 48% who voted remain across the UK is being ignored. "And the voice of those who voted to leave but who could never have contemplated the mess that Brexit has become - their voice is being ignored as well. "But today we make our voices heard. And what our voices are saying loudly and clearly is this: Put it back to the people." She continued: "Do you know if there was a shred of consistency in her position, the prime minister would be standing on this stage right now. "She should be here because in that disgraceful speech she made in Downing Street on Wednesday night, pitching parliament against people, her message was that the voice of the people was being frustrated. So if that is your view, prime minister, let the people speak." Ms Sturgeon accused Mrs May of being "in thrall to hardline Brexiteers". And she called on Labour leader Jeremy Corbyn to back a People's vote. The SNP leader spoke alongside Conservative peer Michael Heseltine and former Attorney General Dominic Grieve, Labour's London Mayor Sadiq Kahn and MPs Jess Phillips and David Lammy. The cross-party event was attended by politicians including Lib Dem deputy leader Jo Swinson and Labour MP Ian Murray. Mr Murray said he was marching on behalf of the 78% of his constituents in Edinburgh South who voted for the UK to remain in the EU. Laura Kuenssberg: Will May try to take back control of Brexit? He added: "This is a march to stop the madness of Brexit. The last 1,000 days have destroyed trust in politics, and time is now running out to avoid a catastrophic no-deal exit from the EU. "This national crisis can only be resolved by putting the decision back to the British public."